Fortune Street (いただきストリート, Itadaki Sutorīto, lit. Top Street) (also known as Boom Street in Europe and Australia) is a party video game series originally created by Dragon Quest designer Yuji Horii. The first game was released in Japan on Nintendo's Family Computer console in 1991. Since then, sequels have been released for the Super Famicom and Sony's PlayStation, PlayStation 2, PlayStation Portable and Nintendo DS. The series was exclusive to Japan prior to the Wii iteration. The series originated as a minigame within Dragon Warrior III, and proved so popular it was decided that it should be released as an individual game. Horii in a 1989 interview stated he was working on a board game with former Famitsu editor Yoshimitsu Shiozaki and that working in a "completely different genre" to the Dragon Quest games was worthwhile. While creating the first stage, a play test revealed the board was really hard, so a practice stage was constructed and was also too difficult, leading to stage one eventually becoming stage four. In 2011, game creator Yuji Horii stated he had considered bringing Itadaki Street to international audiences. The games are similar to Monopoly: players roll one die to advance around a board, purchase unowned property they land on and earn money when opponents land on the player's property, and draw cards when they land on certain spaces. The games differ from Monopoly in that players can buy and sell stocks of a block, affecting the value of the block's stock by buying or selling that block's stock or by developing a player-owned property of that block which increases the value per share of stock for that block. It is not necessary to own the entire block to develop a property, though controlling more than one property of a block allows the player to develop their properties to larger buildings and collect more from opponents. Players must collect a set of four suits to level up and collect additional gold when they pass the starting position/bank. In most versions, up to four players can compete to win each board. To win, a player must make it back to the bank with the board's required amount, which includes the total value of the player's stocks, property value, and gold on hand. Minigames and a stock market for more experienced players are also featured. Famicom Itadaki Street: Watashi no Omise ni Yottette was developed by Loginsoft and released on the Famicom on March 21, 1991. It was published by ASCII. Super Famicom Itadaki Street 2: Neon Sign wa Bara Iro ni operates like a junior version of Super Okuman Chouja Game. Instead of the players making purchases and sales completely on their own, the game offers advice for important situations. There are many themes including modern, futuristic, and the map of the world. Players that are controlled by the game's artificial intelligence range from teenagers to senior citizens. Players can move from 1 to 9 squares and must allow collect symbols from playing cards in order to get money from the bank. Casino gambling is also available and it includes Bingo and slot machines. Like in Tower Dream, the game instantly ends if the only human player gets bankrupt in a game involving 3 AI-controlled players and 1 human-controlled player. PlayStation Itadaki Street: Gorgeous King was released on the PlayStation in 1998. It was published by Enix. As of December 2004, the game has sold over 281,000 copies. PlayStation 2 Itadaki Street 3 Okumanchouja ni Shite Ageru: Kateikyoushi Tsuki was developed by Tamsoft/Crea-Tech and released on the PlayStation 2 in 2002. It was published by Enix. In release, the game was sold 163,659 copies in 2002, and Famitsu magazine scored the game a 32 out of 40. PlayStation 2 Dragon Quest & Final Fantasy in Itadaki Street Special was released on December 22, 2004 by Square Enix for the PlayStation 2. One to four players can play at the same time which makes this game different from its predecessors. The game features characters from Dragon Quest and Final Fantasy. As of August 31, 2005, the game has sold 380,000 units in Japan. PlayStation Portable Dragon Quest & Final Fantasy in Itadaki Street Portable includes characters from Square Enix's Dragon Quest and Final Fantasy video game series, though some reviewers said the franchises did not add much to the game. Nintendo DS Itadaki Street DS includes characters from Square Enix's Dragon Quest series and Nintendo's Super Mario franchises, many of which were redrawn to look younger. The game was the second crossover between Nintendo and Square Enix characters. Characters come from a variety of games, and even lesser known character are included such as Yangus the heroic thief from Dragon Quest VIII: Journey of the Cursed King. The games website featured a character creator mixing Mario and Dragon Quest franchises. The Japanese magazine Famitsu gave the game 36/40 points. The game sold 430,000 copies as of August 2008. Mobile phones Itadaki Street Mobile included no branded characters from any video game franchise. The game was a simplified version of the series, and before release a demo was made available that included Shell Island, one of the beginners boards. Mobile phones Dragon Quest & Final Fantasy in Itadaki Street Mobile features Final Fantasy characters from many different Final Fantasy games including Lightning from Final Fantasy XIII in a chibi art style. Wii Fortune Street was revealed by Nintendo at E3 2011 for the Wii, released on December 1, 2011 in Japan, December 5 in North America, December 23 in Europe (or January 6 for another part), and January 5 in Australia. It was the first game in the series to be published outside Japan. The game includes characters from the Dragon Quest series and the Mario series. iOS Fortune Street Smart is an entry in the series developed for smartphones. In Japan, the game was released for Android devices on January 23, 2012 through the Square Enix Market, and for Apple iOS on March 22, 2012 through the App Store. The game was released overseas for iOS on May 31, 2012 through the App Store. It does not feature licensed characters from other series such as Dragon Quest, Final Fantasy and Mario. Itadaki Street: Dragon Quest and Final Fantasy 30th Anniversary JP: 2017 PlayStation 4, PlayStation Vita Developed by Tose and released in Japan on October 19, 2017. 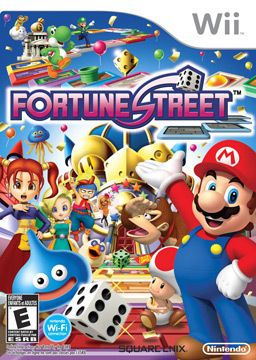 IGN gave the series' first localization in America, called "Fortune Street", a "Good" rating, for its deep board game gameplay but saying it could have been more interactive. Siliconera noted that the introduction of established franchise characters from Final Fantasy, Dragon Quest, and the Mario games' has greatly increased the games popularity and mindshare. Fortune Street, the series' first international release, was greeted with mixed reviews, praising the character selection and deep gameplay, but slighting its lengthy time commitment. ^ Provo, Frank (March 30, 2001). "Dragon Warrior III Preview". GameSpot. Archived from the original on April 11, 2013. Retrieved April 5, 2013. ^ Aria (December 10, 2011). "Origins of the Legend of Zelda: A Link To The Past And Dragon Quest IV". Siliconera. Archived from the original on March 28, 2013. Retrieved April 5, 2013. ^ a b Aria (December 11, 2011). "Miyamoto Asks Horii: Do You Think RPGs Will Become A Substitute For Novels?". Siliconera. Archived from the original on March 25, 2013. Retrieved April 5, 2013. ^ Gilbert, Henry (February 17, 2011). "An interview with Dragon Quest creator Yuji Horii". gamesradar. Archived from the original on May 2, 2013. Retrieved April 5, 2013. ^ Jennie (April 30, 2008). "How to get to Itadaki Street Portable". Siliconera. Archived from the original on October 7, 2012. Retrieved April 5, 2013. ^ a b Yip, Spencer (June 8, 2011). "Square Enix's Itadaki Street Series Localized for the First Time on Wii". Siliconera. Archived from the original on August 23, 2014. Retrieved April 5, 2013. ^ "プレイステーション2 – いただきストリート3 億万長者にしてあげる! ~家庭教師付き!~". Weekly Famitsu. (915 Pt.2. ): 73. June 30, 2006. ^ Gantayat, Anoop (May 31, 2006). "Final Fantasy vs. Dragon Quest". IGN. Archived from the original on October 4, 2013. Retrieved April 5, 2013. ^ Yip, Spencer (June 7, 2007). "Characters in Itadaki Street DS". Siliconera. Archived from the original on February 3, 2015. Retrieved April 5, 2013. ^ Yip, Spencer (October 19, 2006). "Screenshots of Mario in Itadaki Street". Siliconera. Archived from the original on February 3, 2015. Retrieved April 5, 2013. ^ Yip, Spencer (March 13, 2007). "Yangus in Itadaki Street DS". Siliconera. Archived from the original on January 19, 2010. Retrieved April 5, 2013. ^ Yip, Spencer (June 18, 2007). "Mix Mario and Dragon Quest in your Itadaki Street DS character". Siliconera. Archived from the original on September 7, 2008. Retrieved April 5, 2013. ^ Garratt, Patrick (March 17, 2008). "Famitsu's top 25 games of 2007 by score". VG247. Archived from the original on May 18, 2015. Retrieved April 5, 2013. ^ Yip, Spencer (November 19, 2007). "White Engine development stalled, Final Fantasy XIII too?". Siliconera. Archived from the original on December 18, 2013. Retrieved April 5, 2013. ^ a b Yip, Spencer (September 18, 2007). "Itadaki Street hits mobile phones". Siliconera. Archived from the original on July 8, 2008. Retrieved April 5, 2013. ^ Yip, Spencer (May 23, 2010). "Lightning Shows Her Soft Side in Itadaki Street Mobile". Siliconera. Archived from the original on December 3, 2010. Retrieved April 5, 2013. ^ "『いただきストリートWii』スクウェア・エニックスより発売決定". Famitsu. June 8, 2011. Archived from the original on October 25, 2012. Retrieved April 5, 2013. ^ JC Fletcher (June 8, 2011). "Fortune Street favors the board game fan". Joystiq. AOL. Archived from the original on October 20, 2012. Retrieved April 5, 2013. ^ "Itadaki Street: Dragon Quest & Final Fantasy 30th Anniversary announced for PS4, PS Vita - Gematsu". September 13, 2016. Archived from the original on January 16, 2017. ^ Drake, Audrey (December 2, 2011). "Fortune Street Review". IGN. Archived from the original on January 14, 2016. Retrieved April 5, 2013. ^ Yip, Spencer (October 2, 2006). "Mario battles Dragon Quest slimes in Itadaki Street DS". Siliconera. Archived from the original on August 12, 2011. Retrieved April 5, 2013. ^ Drake, Audrey (November 21, 2011). "Fortune Street: Mario Meets Slime Meets Monopoly". IGN. Archived from the original on March 4, 2016. Retrieved April 5, 2013.